What was the biggest thing you felt when you finished Reached? Was it hard to say “goodbye” to the trilogy? I know you recently said on your blog that you were writing something new, but did you have things in mind even before you finished the Matched books? *The biggest thing I felt was bittersweet. It's hard to say goodbye, but at the same time it feels like the story continues beyond the pages. It was my job to take the characters to a certain point...and then let them go. And that was a bit sad and exciting all at once. And yes, I did have ideas in mind for new stories even before I finished this trilogy. I am always getting new ideas. But I didn't let myself really explore anything until I was done with REACHED--I'd take notes and write bits of a scene here and there, etc., but that was all. Can you write while someone is watching TV in the next room? Or do you need total silence? *I need total silence sometimes, and other times nothing bugs me. So I've splurged and purchased a set of noise-canceling headphones for those times when I'm too easily distracted. They have been awesome! Matched has been published in so many languages! Congrats! Do you own any of the international editions? Do you speak any foreign languages? *One time this really nice kid asked me to sign his arm. That isn't that strange or weird, but I felt uncomfortable doing it. What if his mom got mad? So I got him a piece of paper and signed it instead. Honestly, I have the nicest fans. I must be lucky! I have sad news, friends! I actually don't have a copy of Matched nearby to fill in this mad-lib. BUT I will by the end of today. So check back!! You can win a SIGNED copy of Matched! Today's giveaway is hosted by The Shangri La of Books. Head on over to win. This giveaway is open TO US ONLY. Thanks so much for the interview! I recently read Mtched and must say it was a wonderful book! 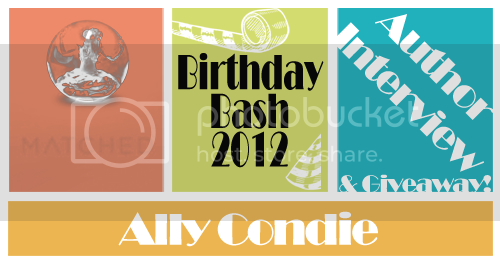 Have loved Ally Condie ever since I picked up Yearbook. Can't wait to read REACHED! Ending a trilogy or series is always hard, but it is exciting to move on to new things. I look forward to reading Reached soon! She does seem really nice, and one of my friends who met her says she's the best. So there you go. I love this series! I cannot wait for Reached! I'm really excited for Reached! It's so cool that the publishers send her copies of the ones in different languages. I am really excited to read Reached. It's always great to hear from the Author. Thanks for doing an interview with her. I love shingaurds! Soccer players in your house? Great post. I need total silence to read so definitely understand needing silence to write. I absolutely adore Ally Condie. Her books are so beautifully written. 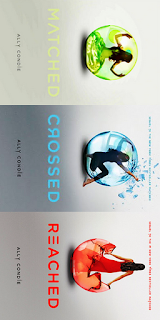 I cannot wait for Reached to be released!